It was one of those days when nothing seemed to go quite right. Beginning with freezing rain, and then my schedule being delayed due to circumstances beyond my control. By two o’clock, I was starting to get rather pissy. I had been gypped out of being able go to the barn to ride Remy. So I needed a mental health break, even for a brief period. 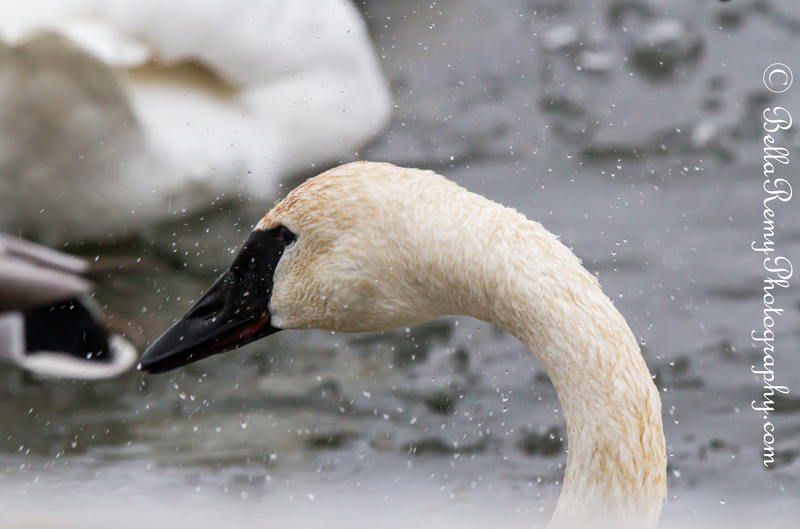 As it was raining and misty out, I thought that photographing the Tundra Swans may prove to be rather interesting. 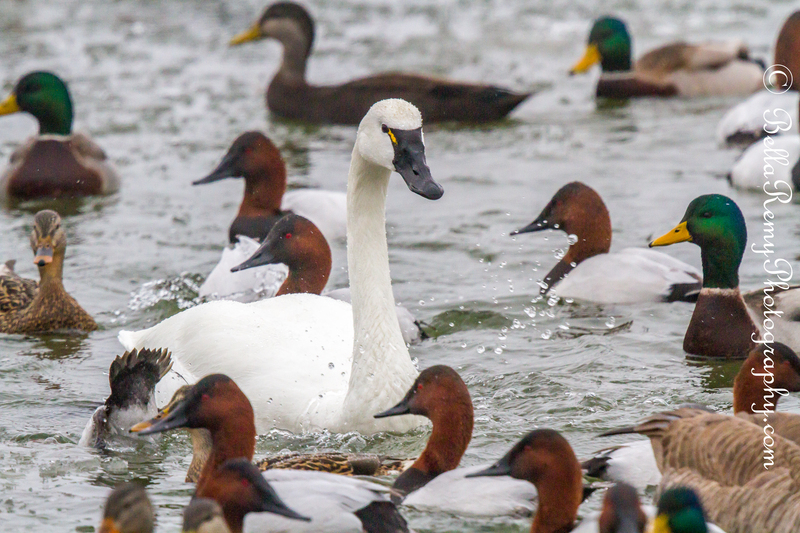 I also wanted another try to find the Trumpeter Swan that is residing with the Tundra flock. The Canvas Back ducks were closer this time, and being a newly educated smart duck photographer, I now carry whole kernel corn in the back of my car. Throwing corn out on the ice, the ducks quickly gathered, with the swans close behind. In spite of it raining and being 35 degrees, there was still some ice on the river. I had great fun watching the Canvas Back ducks slip and slide on the ice. Seems they’re not as adept as the mallards are. I think this guy was actually a little embarrassed that there was a witness to him sliding around. 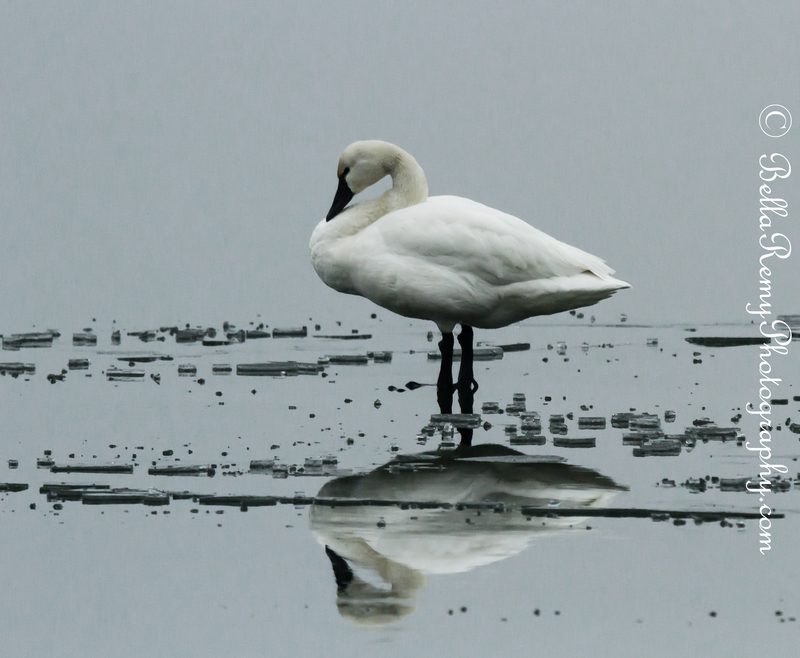 Some swans were sitting elegantly on the ice before they realized that corn was available for an afternoon snack. So standing in the rain..I looked for the needle in the haystack. Surely the Trumpeter is in the group somewhere. 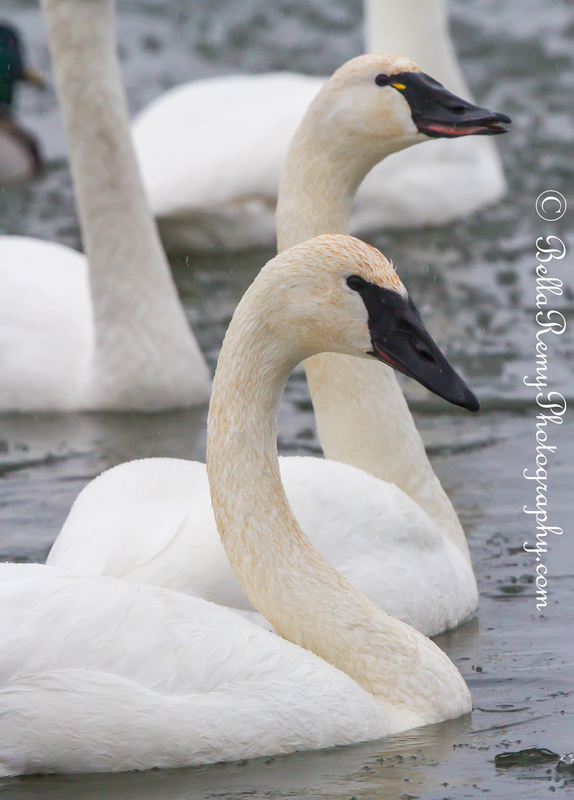 There were actually more Tundra Swans today than there were on Wednesday, so I had more swans to examine. Didn’t help that they kept moving and hiding their heads. There is little difference for the untrained eye to be able to tell the difference. The main one being a distinctive “V” where the bill meets his forehead. 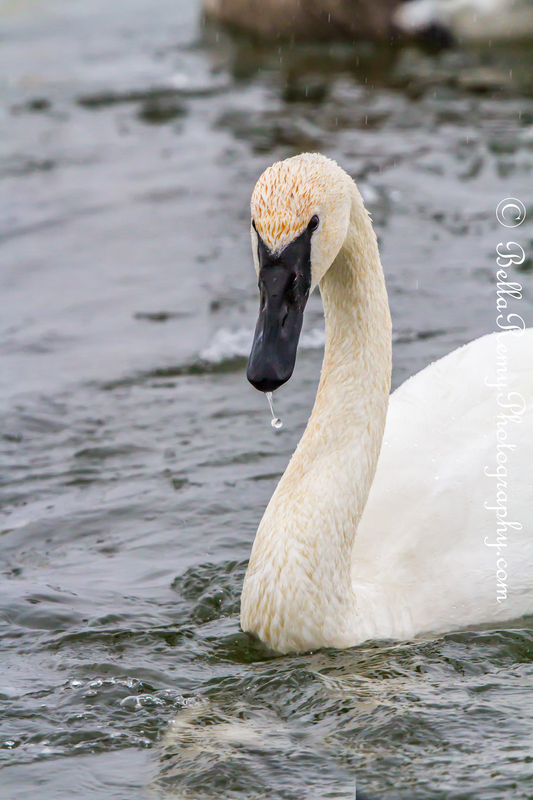 All of sudden, I noticed a swan raising his head from a dive, droplets flying. Could it be? Is it possible? Did I actually manage to pick him out from the crowd! By golly I did !! Notice the “V” on his forehead made from the black bill? 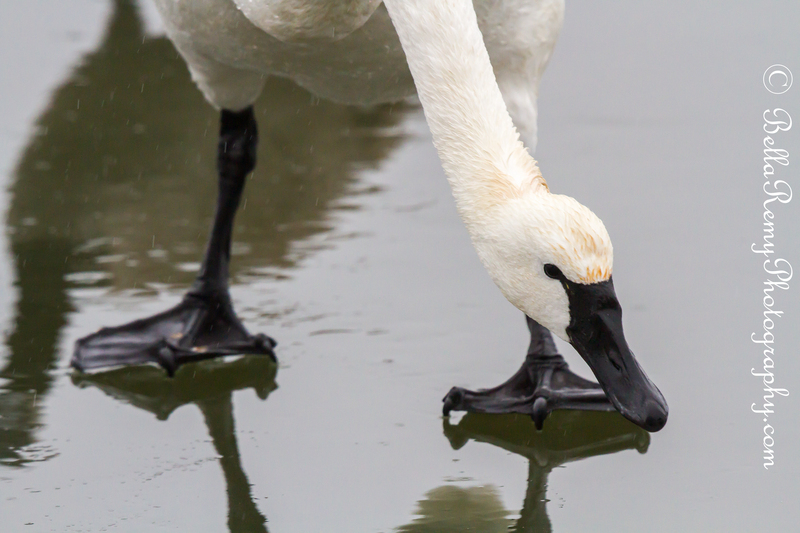 Now you can look at a Tundra Swan’s head and it’s clearly different. After finding my quarry and being able to capture a number of images, I had to go. The rain was getting harder and life duties were calling my name again. I’m so glad that I went. Even if it was a short 20 minute visit, it was enough to clear my head, cool my jets and be joyful with the beauty I was able to experience. 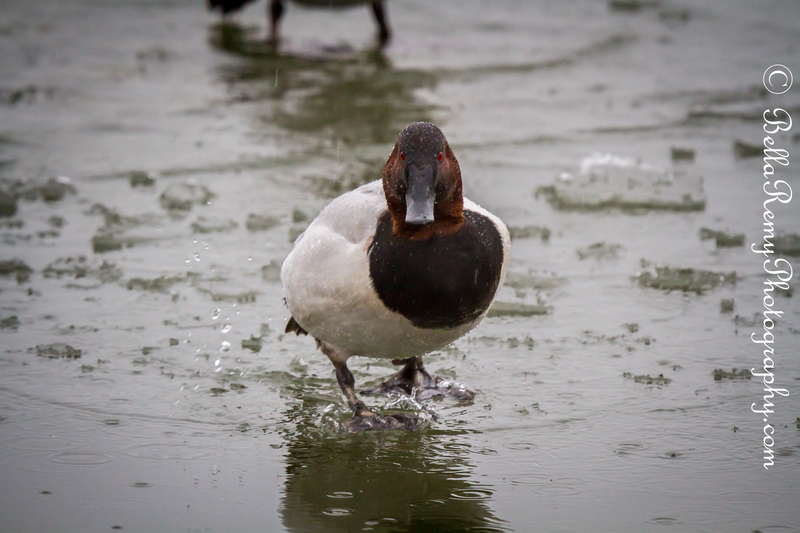 It was worse the effort just to get the photo of that embarrassed Canvasback. GREAT photo! Absolutely it is ! Hope you manage to get out to see the Trumpeter. Saw the Trumpeter this morning! Getting ready to go through my photos now! Also saw some Black Scoters at Thomas Point. Great day of birding! I am so glad you went. V for victory. Applause to you to capture every droplet. Hugs to you ! Are you enjoying your break from the 365 or are you starting to miss it? Ohmygosh, the one with the droplet off the swan’s bill. Incredible. These are some really awesome shots! Well done. I love these photos. Keep up the good work! You are so sweet Samantha. Thank you so much and I’ll try my best to. Sorry that you had a bad day. 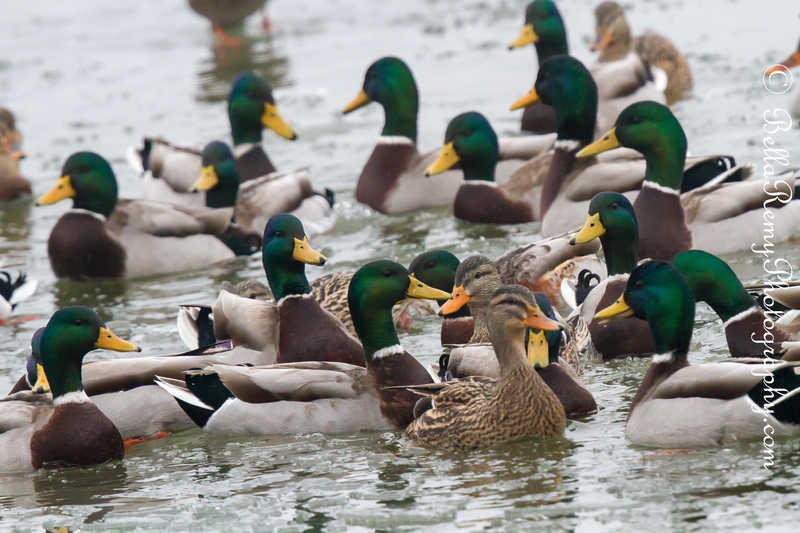 That’s quite the mass of mallard in the first photo. 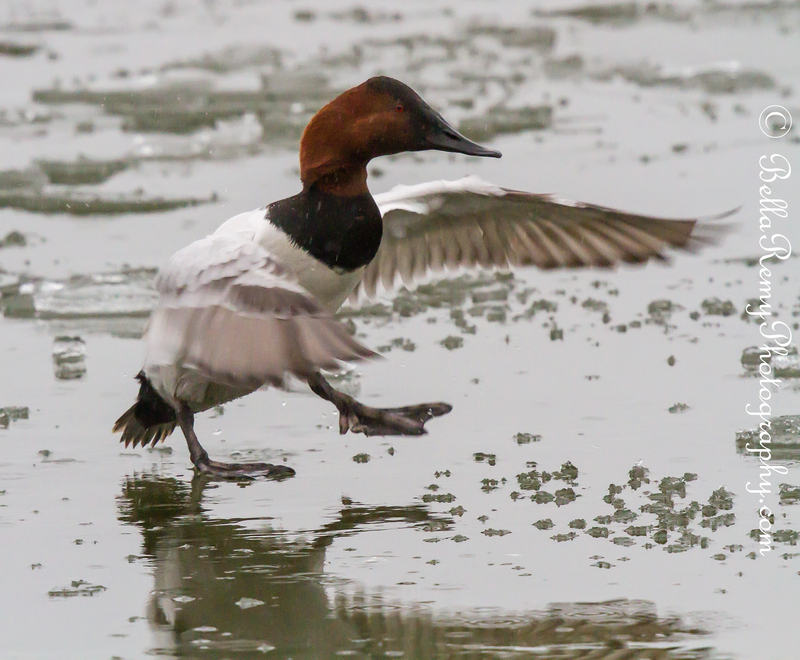 The canvasbacks are diving ducks, so they have more trouble walking on land due to their legs being set so far back on their bodies. You have more patience than I to “sort” through a flock of one species of bird to find the one individual of another species. I’ve missed several species of gulls because I don’t have the patience to scope out a flock of several hundred herring gulls to find the one Icelandic gull known to be in the flock, as one example. You always know how to make me smile. Indeed, I was bound and determined to find the Trumpeter that visit. But I’m with you – hundreds of gulls to find the one Icelandic – NOPE !! Too hard for me. Wonderful shots! Enjoy your weekend! Thank you so much. So far, a quiet Saturday morning. So lovely! Indeed, they do. Although I’m starting to appreciate the rain. Would much rather have rain then a drought. How are you surviving your bitter winter? It’s actually 35F now, so not bad! It feels like spring… haha! That’s fantastic ! Amazing how 20 degrees can make a difference. It was mid 50’s for us, and it was warm. Thank you so much Rexlin ! Great to see you and hope you’re having fun this weekend. It is so true Mark ! Especially when it returns one back to nature. I learned something today 🙂 great shots. Really ? That is amazing, as I think you to be such an awesome photographer. So kind and very much appreciated, Emily. Thank you. Now it’s my turn to learn much from you. Love your theme and how it displays your portfolio. Love what you’re doing with your work. You’ve work is truly amazing. I am glad you went too 🙂 These are so beautiful! I’m so thrilled that I was able to share these with you. Seems like a great choice for a mental health break. Swans are beautiful birds and you captured them well. I’ve not seen a Canvas back up close and your images are great, pretty funny too. Thanks for sharing! It’s amazing what doors open when one uses patience. Thank you so much Denise and hope all is well with you.